Much like a sunrise, the Dawn is picture-perfect. 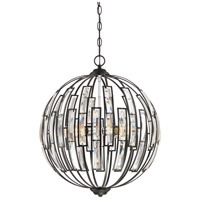 Its bold orb design features a series of beveled glass accents that intensify the inner light with prismatic panache. A dark earth black finish showcases the exquisite details of this stunning fixture.